INTERNET RESOURCES Because of copyright issues, very few of Freud’s writings are available in full on line, but here are some other useful sources. www.freud.org.uk, the website of the Freud Museum in London. The Freud Museum is located in the house Freud lived in for the final years of his life, 20 Maresfield Gardens, Hampstead. The house remained the home of Freud’s youngest daughter, Anna, an important analyst in her own right, until her death in 1982. The museum’s website provides information for researchers, photographs of Freud and his family, links to other Freud sources and information about conferences and exhibits. http://psychclassics.yorku.ca, Classics in the history of psychology. This website makes available electronically the full text of a number of scholarly works on the history of psychology. It contains early, pre-Standard Edition translations of The Psychopathology of Everyday Life and The Interpretation of Dreams, among other works. http://webspace.ship.edu/cgboer/freud.html. 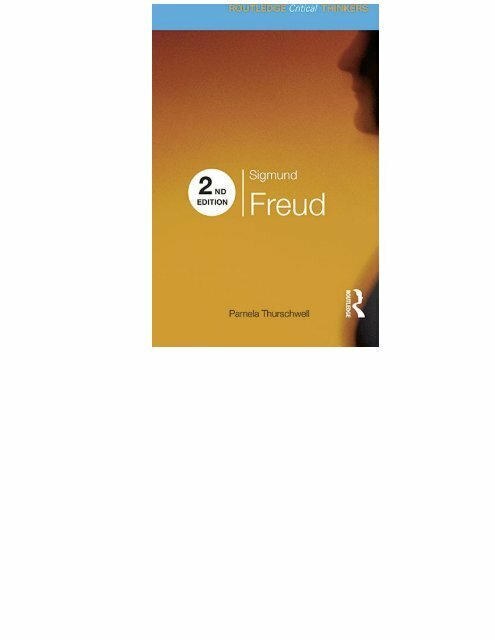 This page provides a biography of Freud and an outline of his theories from early conceptions to later drafts. www.cyberpsych.org/apf/, American Psychoanalytic Foundation. A reading list of articles and books on psychoanalysis. www.freud-museum.at/e/, website of the Freud Museum, Vienna. www.freudfile.org/ provides information about the life and work of Sigmund Freud. www.loc.gov/exhibits/freud/, the site of the Library of Congress ‘Conflict and Culture’ exhibit on Freud (2001). Interesting for the images it contains, including portraits of Freud, his family and some of his patients. http://nyfreudian.org/abstracts_00.html, the New York Freudian Society. Abstracts of the Standard Edition of the Psychological Works of Sigmund Freud. www.melanie-klein-trust.org.uk, a site to promote the work of Melanie Klein.